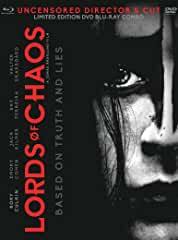 Unobstructed View and MVD Entertainment Group are pleased to announce the release of Lords Of Chaos on Blu-ray / DVD combo and DVD on May 28th in the US and May 21st in Canada. It's a thrilling coming of age horror/drama, weaving together rock'n'roll, youth, love, and death through an incredibly dark story. Renowned Swedish director Jonas Åkerlund (Polar) brings his notorious visual aesthetic to the film, alongside ground-breaking performances from Rory Culkin (Succession, Signs, You Can Count On Me) and Emory Cohen (The Place Beyond the Pines, Brooklyn). Inspired by a true story, Lords Of Chaos made its debut at the 2018 Sundance Film Festival before going on to impress audiences at Fantastic Fest, Beyond Fest, Fantasia Festival, and more.